Set includes: 1. Tracheal mask. 2. 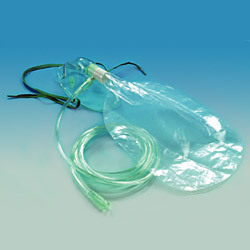 2-meter oxygen tube. 3. Six-color coded concentration jets. 4. 15cm connector. 5. Six diluters: blue = 24%, yellow = 28%, white = 31%, green = 35%, red = 40%, orange = 50%.